This is in the Desert Community. The creek that runs behind the cemetery is Desert Creek. The cemetery is clearly marked "Crossroads" but the Rand McNally maps call it "Desert Cemetery." There are no road signs for Desert on SH 121. The Desert and Crossroads names are used equally in referring to the area and the school and stores and churches. At one time there were separate schools for Desert and Crossroads. They were united into the Asa Walker school district. This was the area of the Asa Walker school. He donated land for the school and a teacherage. 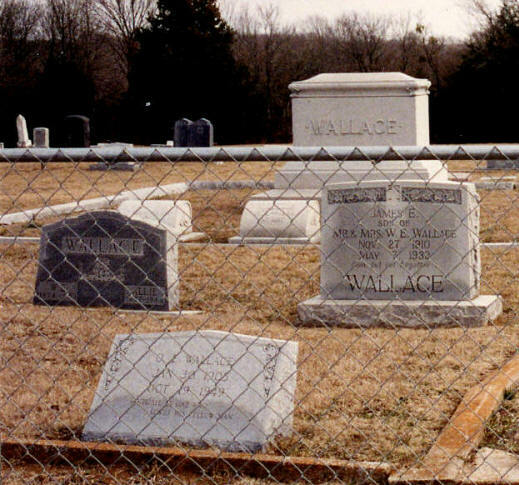 The land for the teacherage was sold to the Dessert Cemetery Association for the cemetery in 1955. The deed is listed in Vol 576, p 292, and is for about 1 ¼ acres. Desert got its name when someone was left behind to guard a campsite. He heard noises and thought it was Indians. He "deserted" the campsite. When they returned to the campsite, it had been ransacked. 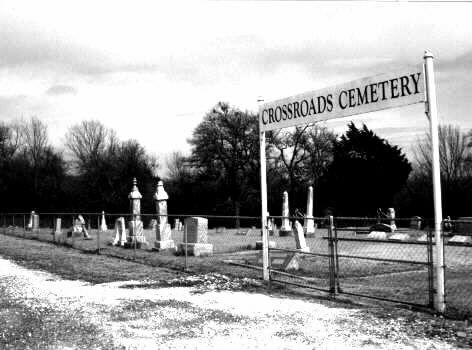 This cemetery is next to the road. It is surrounded by a 4-foot chain-link fence and has an arch with its name over the entrance. It is very full with plots gridded off with bricks. There was one broken stone with the pieces piled next to the base.